Gisella Collazo smiled Monday as a supporter wished her luck. Collazo, who took sanctuary at South Congregational Church after she was told by immigration officials to return to Peru, left the church for the first time since March 26. A Peruvian woman who had been living at a Springfield church to avoid being removed from the country has been granted a one-year reprieve from deportation, and on Monday, she left the church for the first time in months. Collazo and her two children, ages 11 and 4, took sanctuary at South Congregational Church on March 26 after Collazo was told to return to Peru by immigration officials. Collazo’s husband, who is a US citizen, remained in the family’s apartment in Springfield, but was able to visit. Her stay at the church angered Domenic Sarno, the city’s mayor, who threatened to strip South Congregational of its tax-exempt status. He did not respond to a request for comment Monday. Collazo’s stay of removal does not change her immigration status, but does give her and her attorneys more time to apply for naturalization. “Gisella was able to exhale in a way she hasn’t been able to since she went into sanctuary,” said Tara Parrish, director of the Pioneer Valley Project, a social justice organization that aided Collazo during her stay at South Congregational. A spokesman for Immigration and Customs Enforcement confirmed that a stay of removal was issued for Collazo, but said it is the agency’s policy not to comment on the specifics of individual cases. According to the Pioneer Valley Project, Collazo came to the United States from Peru in 2001. She married in 2005, and she received a work permit in 2006. Her attempts to become a US citizen hit legal snags, however, and in January she was told to return with a ticket to Peru on March 26. Throughout her stay at South Congregational Church, Collazo received support from the Springfield Interfaith Sanctuary Coalition, which is part of the Pioneer Valley Project. 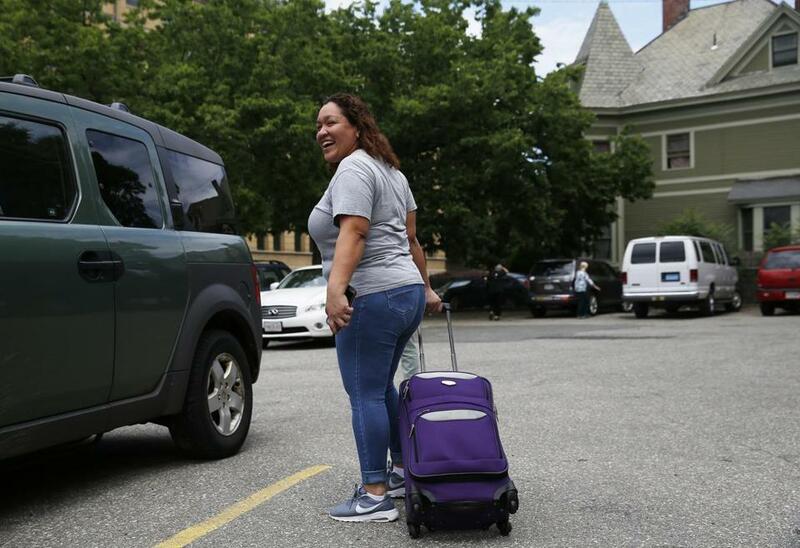 “We’re very excited for Gisella that she gets to go and continue to do what we say we value in the US — and that’s building families,” said the Rev. Tom Gerstenlauer of South Congregational Church. Gerstenlauer said the church has received numerous letters and donations in support of Collazo. But the mayor’s anger over the church’s sanctuary status led to a search of the church’s apartment by city officials in April for “illegal housing aspects.” Only minor violations were found, and on May 24, a second inspection concluded that all prior violations had been taken care of. In response to the mayor’s actions, the Springfield City Council unanimously passed a resolution a few days later to ban city officials from interfering with the religious freedoms of the South Congregational Church and other religious organizations. “Our quarrel was whether the city should be actively involved in the activities of the church,” said Timothy Ryan, one of the resolution’s sponsors. Parrish said Collazo’s stay of removal is a victory for the Pioneer Valley Project.